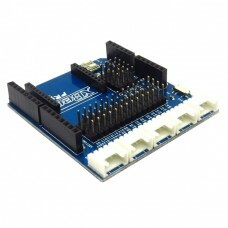 This Arduino Sensor Shield features a collection of pin headers and connectors to simplify connections to various sensors. This handy Arduino Shield has SVG Signal Voltage and Ground pin headers for 20 digital input/output pins and 6 analog inputs pins. Having access to the power pins greatly simplifies sensor wiring. Five Grove compatible 4 pin connectors are also provided and each Arduino pin is available via a standard header. A power selection switch allows either 3.3V or 5V at the SVG voltages pins. A reset button is also included. 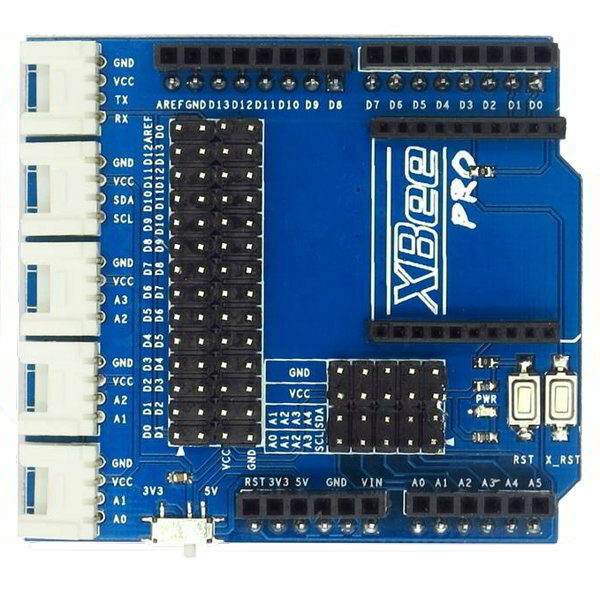 This Arduino Sensor Shield includes an XBee Pro socket that can be used to implement wireless Arduino communication.